Humpback whales are identified as individuals by the underside of their flukes, or tails. The distinct coloration, shape, and scarring pattern of the flukes’ underside are as unique as a human fingerprint, allowing scientists to distinguish individuals using the pictures they have taken of their flukes. This season, CaboTrek started a photo-identification project in Cabo San Lucas. Our catalogue has more than 250 individual whales. To improve larger existing fluke identification catalogs from the entire West Coast of North America, we share our pictures with Ted Cheeseman from Happywhale, which is a program that tracks individual whales throughout the world’s oceans and with Katherina Audley from the Whales of Guerrero Research Project, which is a project that is studying humpback whales for the first time in Zihuatanejo, in the state of Guerrero, Mexico. As a part of your experience on our boat, you will learn how to identify whales as individuals. We give each whale we spot an ID – CTHW (for Cabo Trek Humpback Whale) along with their respective number. Some of those whales are known to us and have a nickname in addition to their ID number. CTHW#35 – This was our first match. It was sighted in August 2015 in Moss Landing, California and in December 2015 in Cabo San Lucas, Mexico. 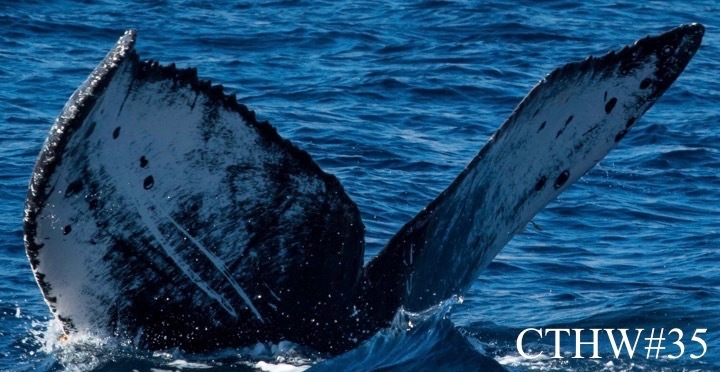 CTHW#84 – This whale, also known as Galaxy, has been sighted 11 times in Monterey Bay and Moss Landing, California, from 2009 to 2016 and, in February 2016 in Cabo San Lucas, Mexico. CTHW#160 – This is a well-known whale. It was sighted for the first time in July 2004 in Port San Luis, re-sighted in Santa Barbara Channel, Monterey Bay and Gulf of the Farallones. CTHW#160 was our first whale sighted in Cabo San Lucas this season. CTHW#243 – This whale is also known as Simba. It was named by one of our youngest guest on the trip of 4 January 2017 here in Cabo San Lucas, Mexico. It was seen for the first time in Monterey Bay in 2003, re-sighted 5 more times in Ventura and Moss Landing, California. It is our intention to raise awareness regarding best whale watching practices and to contribute to understanding of the dynamics of the Northeastern Pacific humpback whale population in order to improve the conservation plan for humpback whales and the ocean. As a Cabo Trek guest you are helping with our research project. Book your trip today!